It had you at "hello". The unique styling. The open-concept living spaces. The 48 Cantius brings a visionary aesthetic to its revolutionary design. Featuring a standard walnut wood interior, the integrated double salons invite conversation and allow the sun to flood the lower salon with its looming radiance. 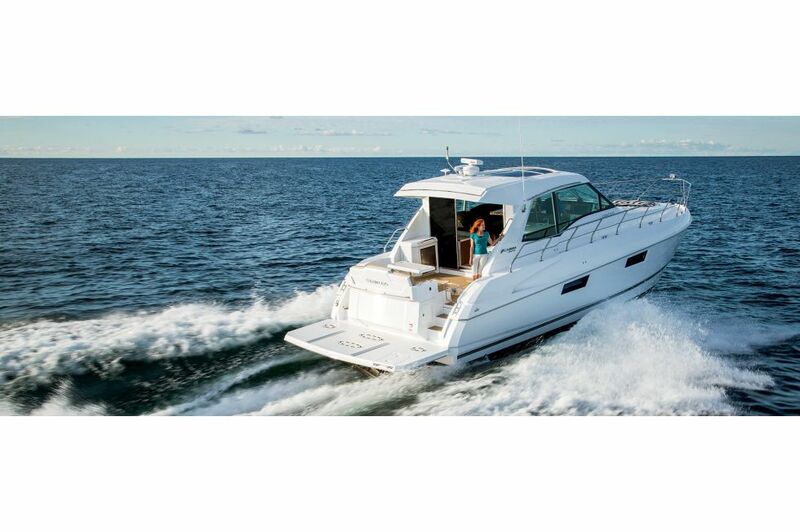 Once you experience the 48 Cantius, no other yacht in the world will feel as satisfying. When you're ready to sit back and know what luxury yachting feels like, the cockpit of the 48 Cantius is a great place to start. Beautiful leather seating is perfectly wrapped with a focus on the upper salon and helm area allowing everyone to feel connected. Stainless steel accents, cockpit shower, drink holders and an easily convertible sun lounge makes this space perfect for entertaining with ease. 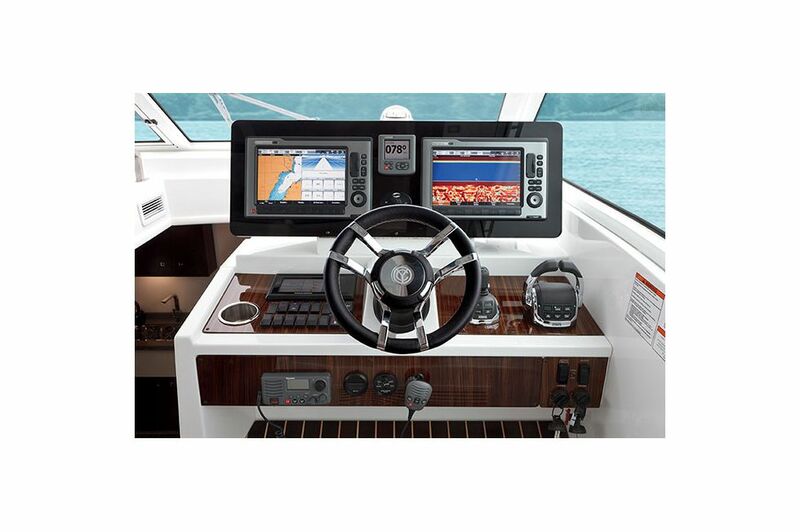 This cutting edge navigational center offers complete views, unique command of the 48 Cantius and easy monitoring the twin Volvo Penta IPS 600 engines. You'll feel confident controlling the 48 foot yacht with joystick maneuvering for efficient and responsive handling. 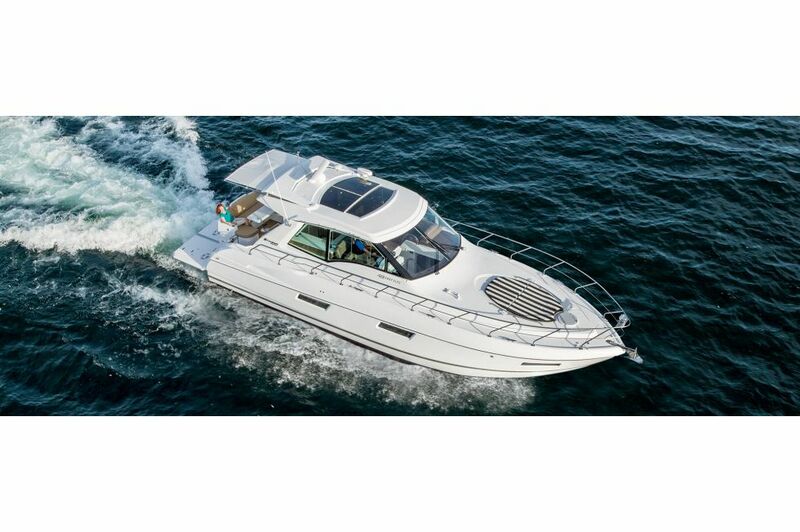 Invite a co-captain to join you at the helm with the double helm seating and flip-up bolster. Rich wood veneer paneling, polished silver controls and a dual raised monitors make the entire helm feel beautifully modern. Never feel cramped with the seemingly endless supply of storage and space aboard the 48 Cantius. A great example is the large transom storage units available on the yacht. Store away tools, watersports gear, safety equipment and more. With a press of a button, have the power to decide just how much the weather will affect your day. The large and striking sunshade allows you and your guests to enjoy the sunshine as much or as little as you'd like. 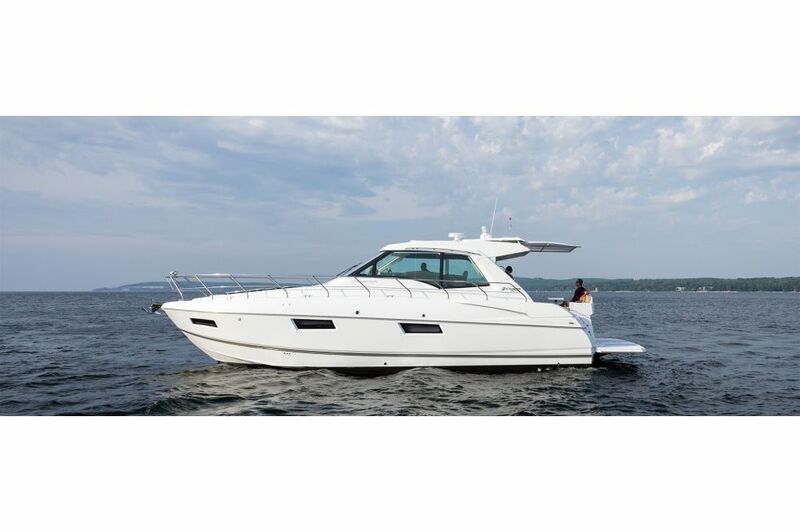 Make your experience aboard the 48 Cantius exactly what you want, when you want it. 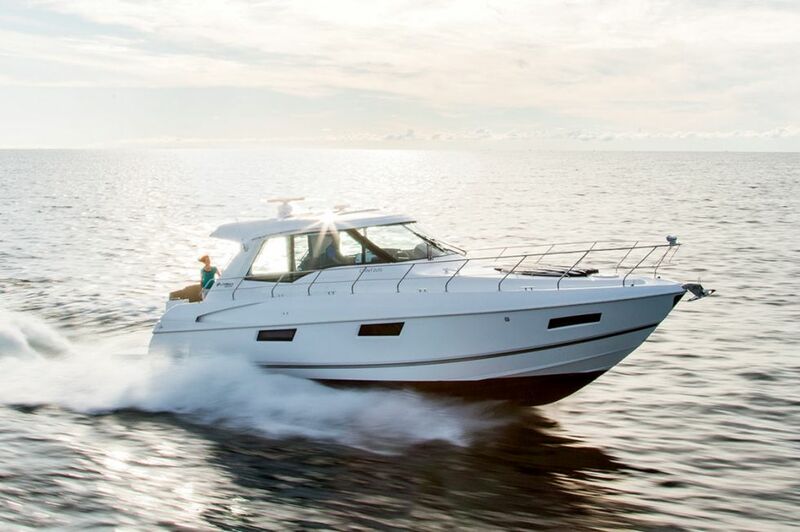 Stay connected to everyone aboard your 48 Cantius with the dual salons this stunning yacht delivers. Walking into the upper salon, you're immediately greeted by natural light streaming in from the large electric sunroof and the windows that wrap around the entire space. 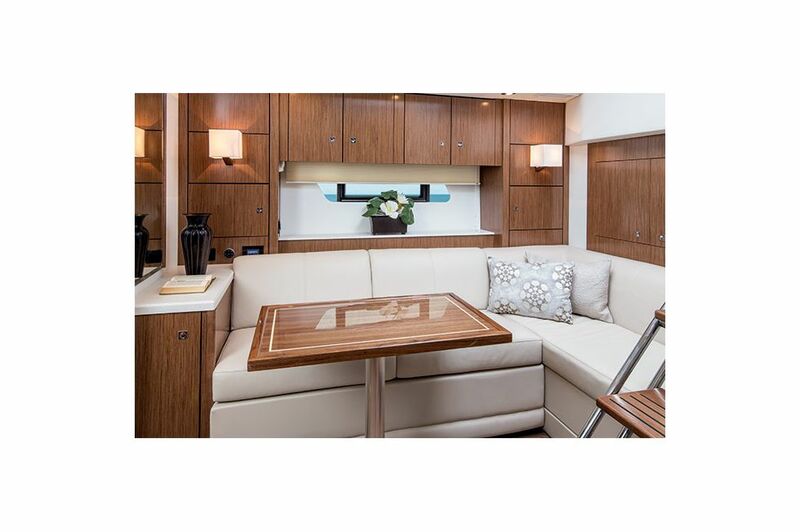 Whether entertaining guests inside the salon or the aft deck, the wet bar along the starboard has a large countertop and built-in sink for easily prepping food or drinks. On the port side, there's a large and deluxe seating that can comfortably seat 6 guests with an accompanying table for books, drinks or even a game of cards. For extra entertainment value, a 32" Sony Bravia TV can be found built into the wet bar counter and raised by a click of a button for an impressive display. Read on to see what the lower salon of the 48 Cantius has to offer you. Below deck, the traditional disconnect between the upper helm and lower salon no longer exists. The seamless integration of the upper helm and the lower salon allows an abundance of natural light to pour into the lower salon. The best space to enjoy that light may just be the standard L-shaped sofa with an optional pullout sleeper or side-by-side incliners that offer seating for six. The addition of a dinette table and the 32" Sony Bravia TV make the lower salon of the 48 Cantius an easy space to relax and enjoy the ride. 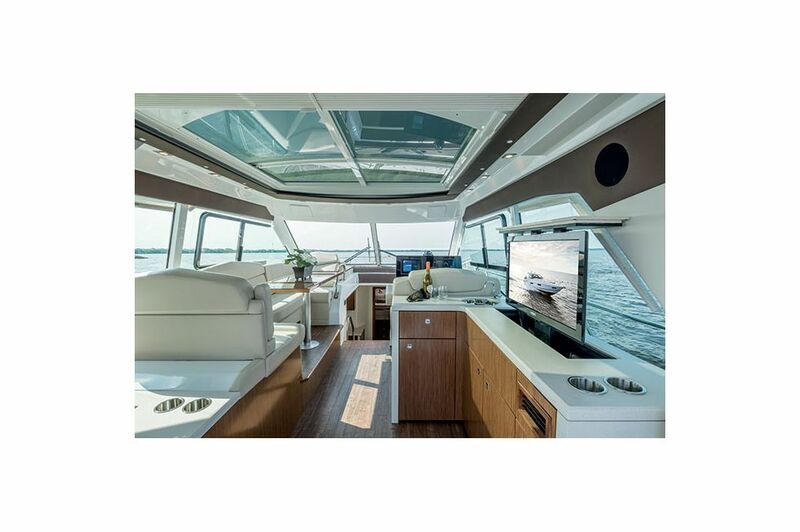 The design and layout of the galley aboard the 48 Cantius will have you feeling as thought you just walked into a hip and modern chef's kitchen. The raised ceilings offer nearly 7' of headroom giving an even more airy feeling to a space that is illuminated by upper salon natural light. 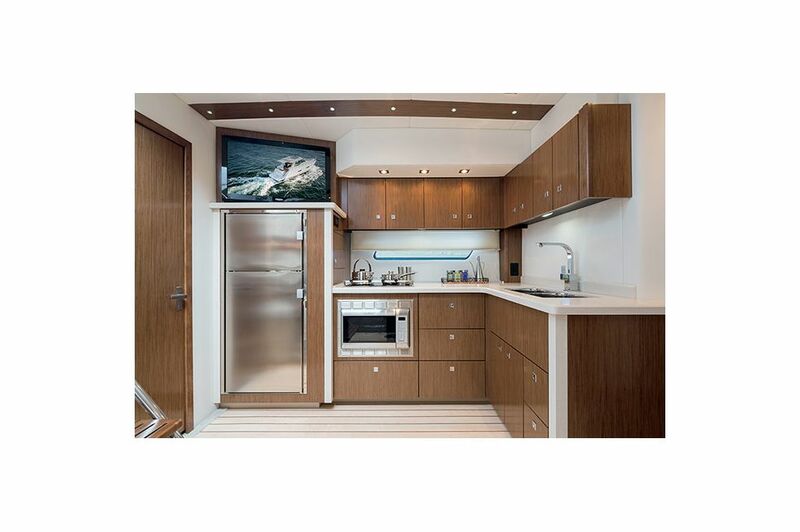 The inventive port side galley is furnished with an upright stainless steel refrigerator and freezer, microwave/convection oven, electric stove, double sink and plenty of storage for supplies. After a great meal, wander into the master stateroom to relax. 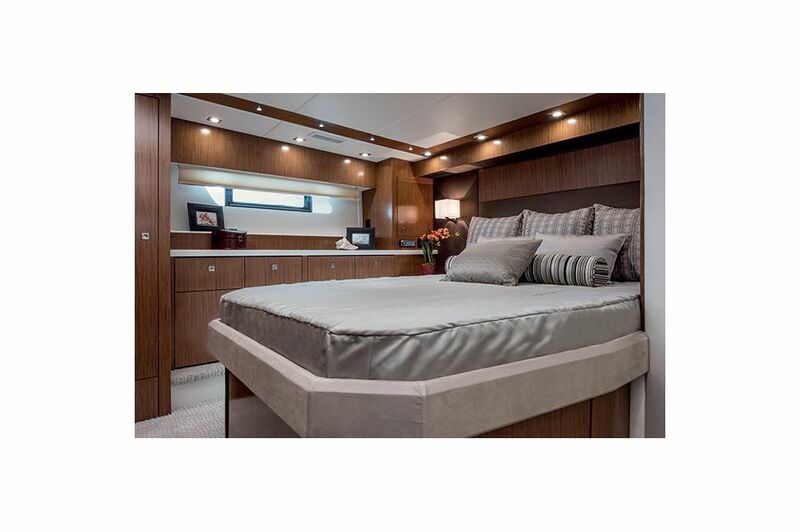 Keep reading to see all the features within the master stateroom of the 48 Cantius. Peaceful, elegant and impeccably styled are just a few words that come to mind as you walk into the master stateroom. With wrap around storage, a fully padded headboard and rich materials throughout, you'll love this private getaway. 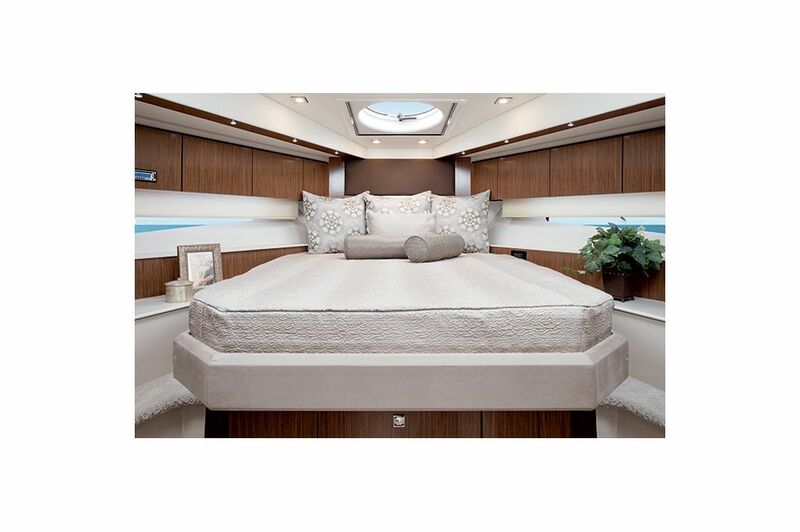 Generous in size and quality, the queen berth aboard the 48 Cantius is a therapeutic mattress which allows peaceful sleep no matter how long the voyage. Want a little more built-in comfort? Take advantage of an optional washer/dryer combo that can be added to the port closet. Give your guests a gorgeous space to call their own with the forward stateroom on the 48 Cantius. Home to a queen-size island berth, wrap-around overhead storage and two full-length cedar closets the forward stateroom is built with comfort in mind. Accessible from the lower salon, guests will appreciate the spacious main head, complete with sink, split shower, and vanity. And with built-in storage and mirrors, it has all the comforts of home and more! 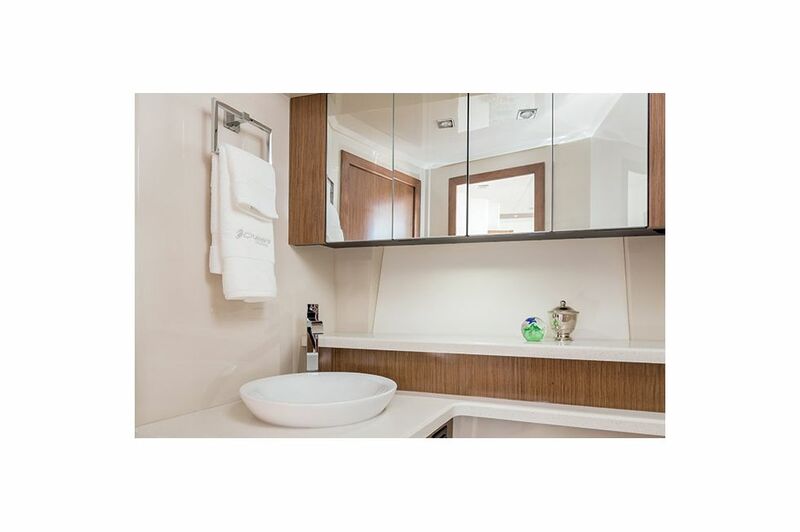 Get ready with ease with the separate vanity and spacious shower stall that comes standard on the 48 Cantius. 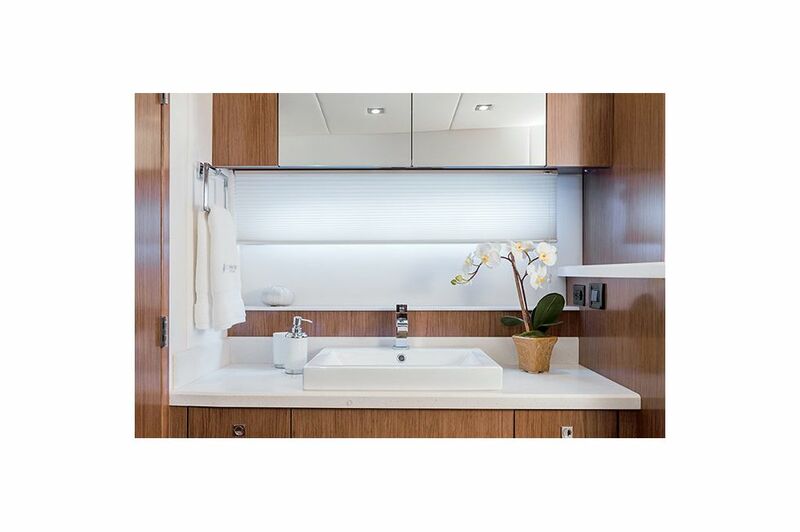 A large vanity sits outside the head's compartment featuring solid-surface countertops, mirrored storage above and perfectly situated lighting to make the space feel bright and inviting. 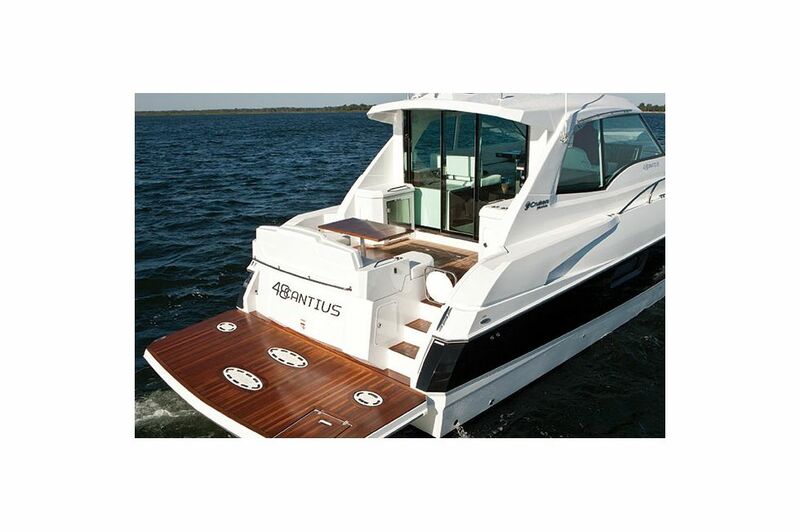 Space, storage and safety accents make the aft deck a part of the 48 Cantius not to be ignored. Drop down the ladder for easy access or grab a chair and a cold beverage. No matter what the day brings, you'll love the extra real estate the large aft deck offers on this stunning yacht. 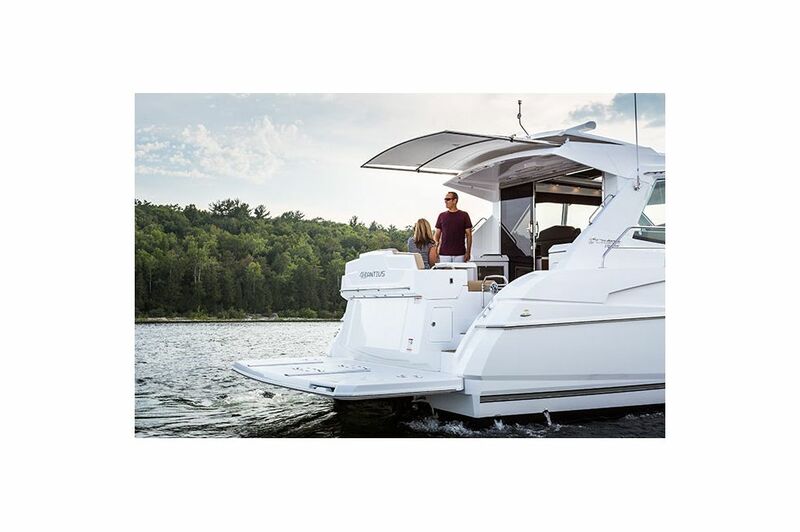 Stretch out and let everything go on the generously sized bow lounge of the 48 Cantius by Cruisers Yachts. You can almost feel the sunshine on your skin and the cool wind coming off the water when you think about the bow lounge. It's calling your name. 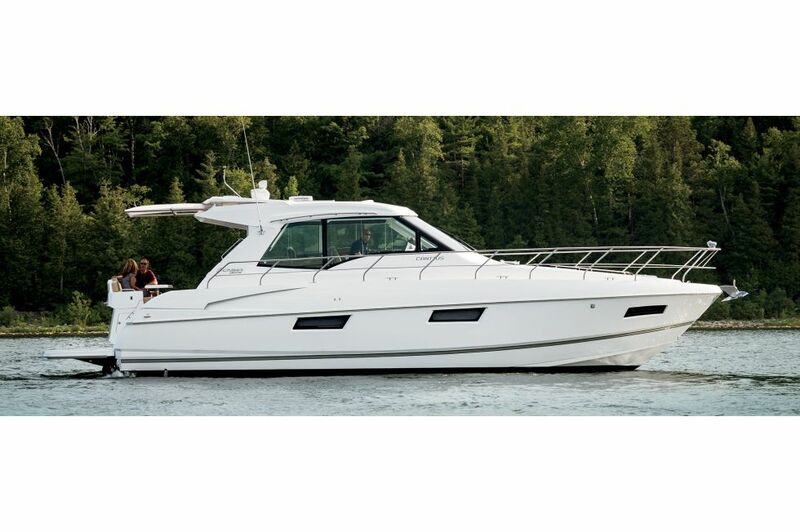 Get to the fun faster with the easy and safe walk-around of this 48 foot yacht. You'll love the safety guard rails for kids and adults alike. Step aboard, walk about and love the thrill that comes from the 48 Cantius. 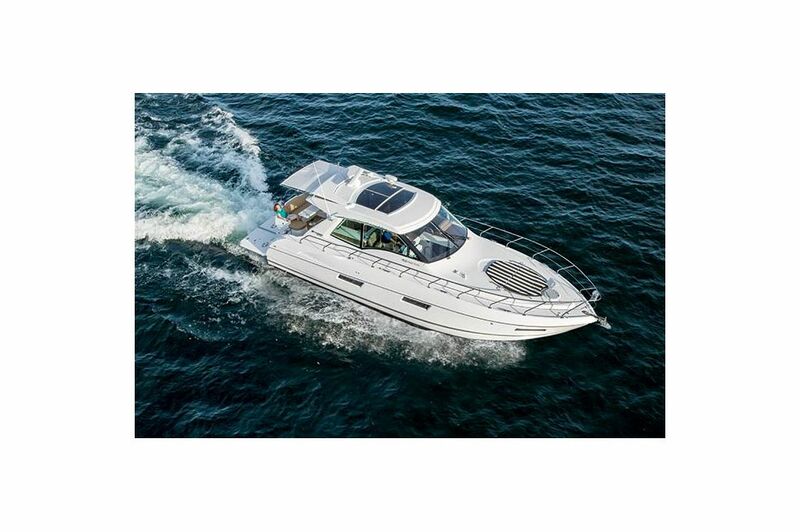 When you see all that the 48 Cantius has to offer you'll want to avoid the shore as long as possible. Extended luxury cruising, even with guests, will be a breeze with the washer and dryer that come equipped on this well-appointed yacht.